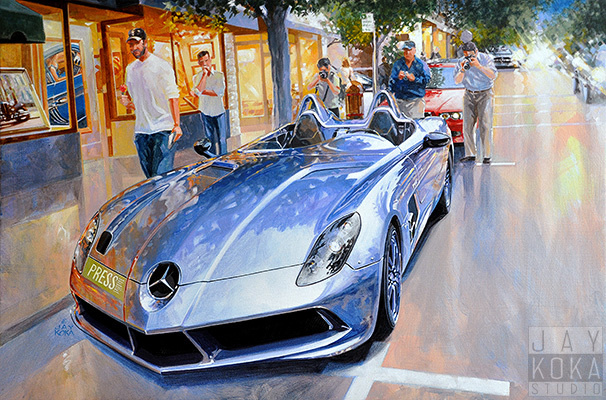 This painting of the Mercedes Benz SLR Stirling Moss was inspired by an early evening walk down Ocean Avenue in Carmel on the way to dinner. The car was the first thing that caught my attention but then I noticed all the people with cameras milling around and the wonderful warm light spilling onto the sidewalk from the stores and the car headlights on the road. Look in the window of the gallery and you will see some Koka originals including the Peter Helck Award winning Savannah No5. 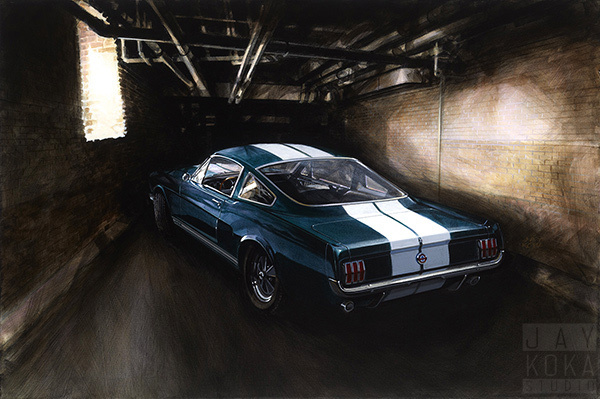 This painting is a 2013 AFAS Exhibition premiere at the Pebble Beach Concours. 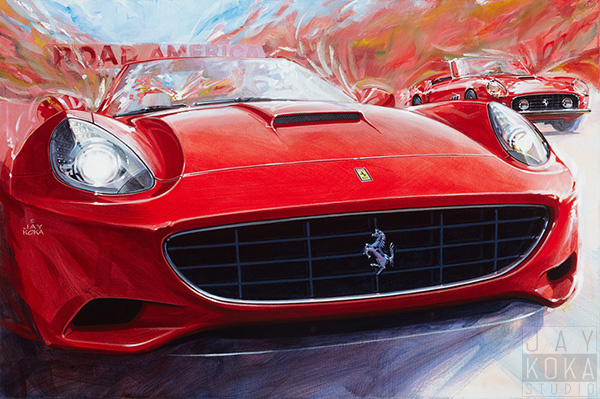 Title: "2013 Ferrari Club of America"
This is one of two paintings that were considered for the Ferrari Club of America 2013 Annual Meet Poster Art and was the art that was finally used. 2013 was the 50th anniversary of the Ferrari Club of America. The event was in late July in Elkhart Lake, Wisconsin. Host hotel was the Osthof Inn and track events were at nearby Road America. This art features a 2013 and 1963 Ferrari California. Title: "Variations on a Theme No2"
This is the alternative considered for the Ferrari Club of America 2013 Annual Meet Poster Art. The 599HGTE featured in this work is the car that was involved in the "One Lap of North America" the yearlong 50th anniversary project of the FCA. Jay Koka: This is...if there is such a thing...the definitive and iconic Shelby GT. I hear Shelby and this is the image that immediately comes to mind. I wanted to do a painting that focused on the "stripes" and presented them as the critically visual element that they are in the design. The only way to do this was to place the car in a dimly lit environment. However, a dark garage as a background lacks visual interest so I decided on a more industrial setting that also introduced areas of intense light and dark...in addition to the wonderful color values like on the right wall. 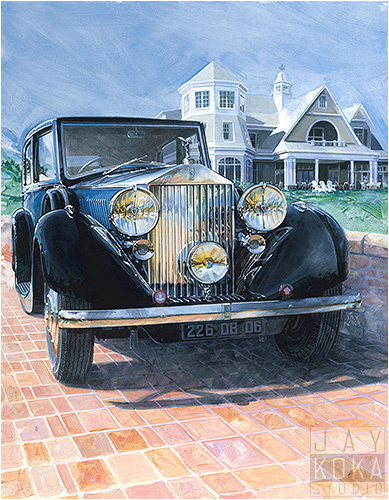 This painting is a 2013 AFAS Exhibition premiere at the Pebble Beach Concours. Jay Koka: The C7 is making news and generating lots of interest. 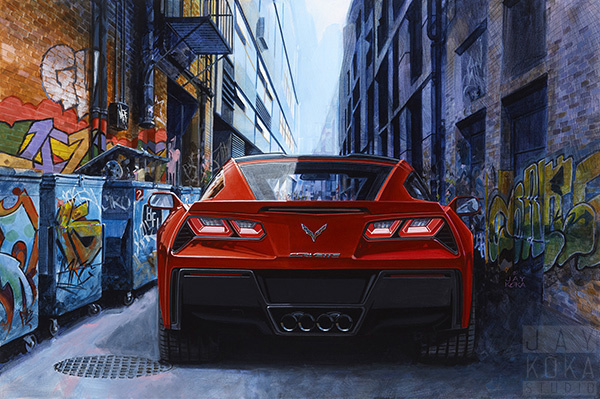 I enjoy the visual of a typically micro-designed automobile where every minute aspect of the design is endlessly revised and refined contrasted with the exuberance and spontaneity of graffiti in a completely non-descript alley way. In fact, the entire painting reflects this contrast with a rigorously balanced layout containing a completely random pattern of graffiti. 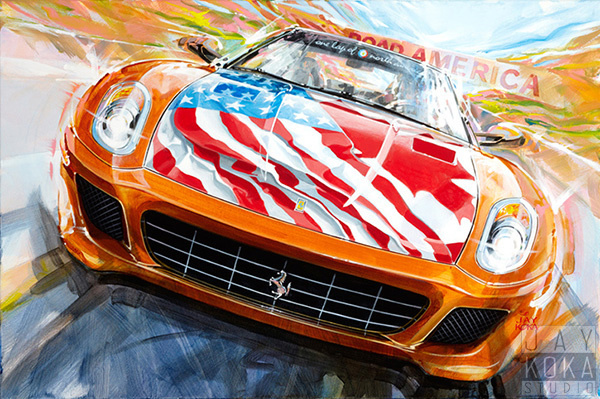 This painting is a 2013 AFAS Exhibition premiere at the Pebble Beach Concours. 2013 is the innaugaral of the Cobble Beach Concours d Elegance to be held on the Cobble Beach golf course near Owen Sound ON Canada. The car is a 1936 Rolls-Royce Phantom III Sedance de Ville. Ordered by the Marquis de Villeroy for delivery to Paris for his use on the continent and while in Britain during World War II. King Karol and the Marquis frequently toured the streets of Paris enjoying the nightlife. Last model of Rolls-Royce that Sir Henry Royce was involved with prior to his death. One of 2 Sedance de Villes bodied by Carrosserie Henry Binder famous for the coachwork on two of the Bugatti Royales.